Are you recently separated and feel lost, anxious, and confused? Have you ever said: "I don't know what to do next", "I don't know what to tell my friends", "We can't even be in the same room"? Mediation has a high rate of success to bring order and stability back to your life and get rid of the chaos. Mediation is a process of negotiation using the services of an experienced, neutral 3rd party. The mediator helps you and your spouse create an agreement, rather than letting the Judge make these life-changing decisions for you. Mediation gives focus and control back to you. Through mediation, you can lower the conflict, reduce legal fees, and build a future as co-parents. Mediation is your best alternative to get your divorce AND keep your family bonds. Download our FREE Special Report "How To Prepare for Your First Divorce Mediation Session". This easy-to-read and informative report will help you understand mediation AND help you understand how to prepare for a successful outcome. Separating your family is a negotiation. Does hearing that leave you feeling scared and vulnerable? Are you struggling to figure out how to get what you want without causing greater conflict? Don't leave your negotiations to chance! 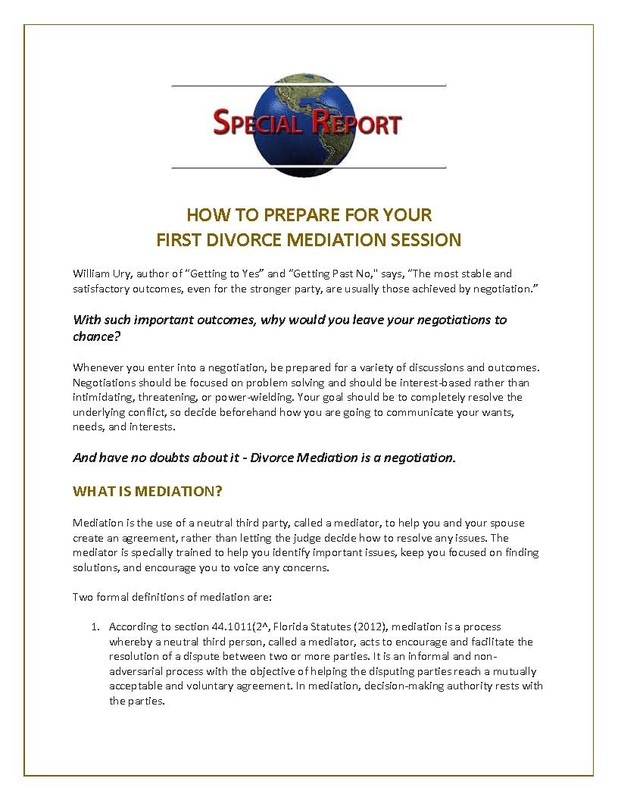 Download our FREE Special Report, "How to Prepare for Your First Divorce Mediation Session". You will learn about mediation, how it helps focus on your concerns, and how it gives you control over the rest of your life.